We had a grand showing in Lexington. There were two tents, Tesla Model Xs and Ss, Chevy Bolt and Volt, Electric Fiat, Ford Focus, Nissan Leafs, and a VW E-Golf. We gave numerous rides and talked to a horde of interested folks. Many of these folks took quite an interest and questioned us at length. Over 30 people gave their email addresses for more information. WE enjoyed the NDEW event in Lexington. I gave about 30 to 40 people rides and everyone seemed to really enjoy them. I was glad Rod Hatfield Chevrolet come by with a new Bolt, they have only been in this area for a few weeks. The variety of EVs on hand was truly outstanding! Join us for our second annual EV event in Lexington. Come with your EV or check out all the EVs in the parking lot, free giveaways under the tent. 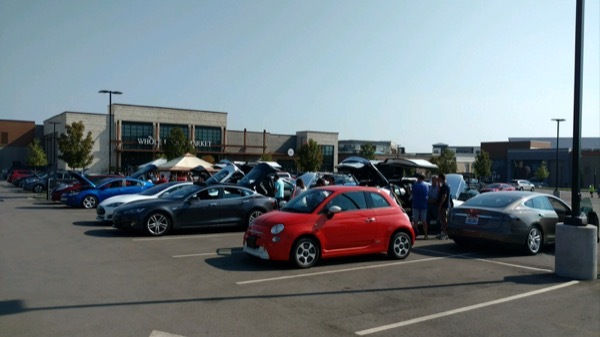 We will be close to Whole Food's new EV chargers, with complimentary snacks and drinks while you grocery shop and then talk with EV owners about their experiences and the latest news on electric vehicles in Kentucky! EVolve KY member cars that could be available at this event include fully all electric: BMW i3, Fiat 500e, Ford Focus EV, Nissan Leaf, Volkswagen E-Golf, Mitsubishi I-MiEV, Tesla Model S and Model X; and the plug-in hybrids Chevy Volt, Ford Fusion Energi, and BMW i8. I can not promise all of these vehicle models will be at any one of our events (each member decides which event they will attend with their car), but we normally have several models at any one event or at our regular monthly meeting. Please come out as see some of the different EV options available in Kentucky. Maybe you might like one of these and the next car you buy could be an EV? Registered attendees report 239,350 electric miles driven.